For the first time a group of scientists from Moss Landing Marine Laboratories, Duke University, and Claremont Colleges is tracking animals south of the equator...The scientists are working hard with Signals to share data in order to learn more about this important species. 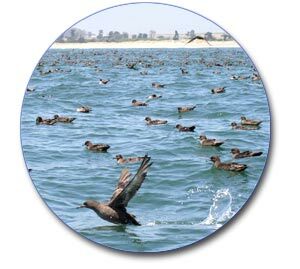 Also new for Fall 2004 is the tracking of Black-footed Albatross. Unlike the Sooty Shearwater, the Black-footed Albatross nests in Northern Hemisphere. Using the data about these two birds, Signals of Spring students will be learn more about these two Pacific seabirds and even a bit about austral spring!